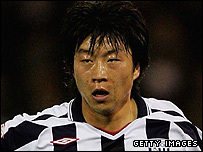 West Bromwich Albion midfielder Kim Do-Heon has been left out of South Korea's preliminary squad for the 2008 Beijing Olympics. Kim, 25, will now be available for the start of West Brom's Premier League campaign, when they take on Arsenal at the Emirates Stadium on 16 August. The midfielder recently voiced his desire to be included as one of the three permitted over-23 players. South Korea have been drawn with Italy, Honduras and Cameroon in Group D.
National coach Park Sung-Hwa has also left out Manchester United's Park Ji-Sung and selected only one overseas-based player in his squad, Zenit St Petersburg's Kim Dong-Jin.